This chapter continues the monograph’s analytical core, first analyzing the subject-text’s ten shorter sequences in the same manner as the preceding chapter, and revealing yet further dialectical elements (Sect. 6.1). 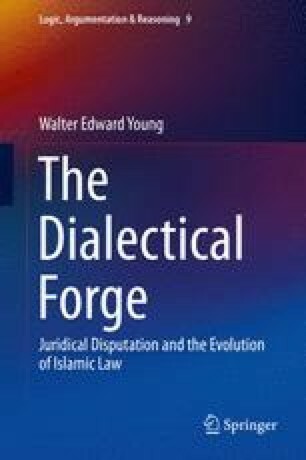 It then proceeds to a survey and analysis of key dialectical formulae, with special focus on a-ra’ayta (“Have you considered…?”) and a-lā tarā (“Don’t you see, or do you not [yourself] opine…?”), drawing conclusions as to their roles with regard to certain argument types (Sect. 6.2). The chapter closes with a brief note (Sect. 6.3) on the subject-text’s argumentative material which is not overtly dialectical, but whose “surface level analysis” was still quite revealing and will appear in the following chapter.